August 22, 2018 -- Royal Philips, the parent company of Philips Healthcare, said it will introduce Epiq CVx, a line of new cardiovascular ultrasound scanners, at the upcoming European Society of Cardiology (ESC) meeting in Munich. Epiq CVx is designed to provide improved image quality for cardiovascular imaging with a cardiology-centric design that enables clinicians to perform faster exams. It offers photorealistic 3D organ modeling with the company's TrueVue mode, which may help improve the diagnostic capability of echocardiography in different clinical scenarios, according to the company. Other features include image slicing and rapid quantification of cardiac anatomy. Philips' Epiq CVx, a line of new cardiovascular ultrasound scanners. Also, the OLED monitor offers a more dynamic, wider viewing angle for side-by-side image comparison, according to the company. Philips believes that combining TrueVue with the OLED monitor will enable clinicians to offer better care, such as for pediatric patients. A feature called Dynamic Heart Model uses anatomical intelligence to automatically quantify left ventricle function to produce a multibeat analysis for adult patients. The mode has been shown to reduce the amount of time needed to produce a 3D ejection fraction, and also delivers a high level of robustness and reliability, the company said. Philips is also launching Epiq CVxi, another scanner in the CVx line for live imaging of interventional echocardiography procedures in catheterization labs. 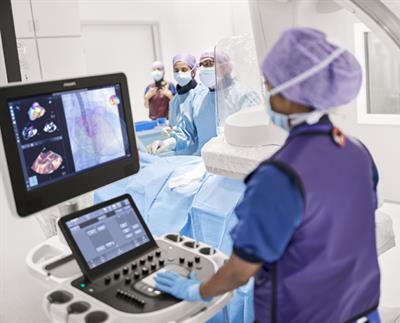 Epiq CVxi integrates ultrasound and angiography into a single system -- streamlining communication between the interventional cardiologist and the echocardiographer for structural heart procedures, Philips said. Both Epiq CVx and Epiq CVxi have received the CE Mark and 510(k) clearance from the U.S. Food and Drug Administration (FDA).